As anyone in sales, or consulting, or technology, or materials management, or vendor hardware, or you name it will tell you, the healthcare industry has a ridiculously long sales cycle. It takes months and even years to get approval on even the most basic goods and services. Bedpans, paint colors, implants, EMRs, servers, everything! Why? Because everything (and I really mean everything) is decision by committee. Good for fostering relationships, getting everyone’s buy-in, and singing “Kumbaya”….Bad for business. Recent headlines and national debates have centered on the “rising costs of healthcare” as the Baby Boomers start and continue to retire in record-breaking numbers. Yes there are ways to cut costs in almost every facet of healthcare. Why not start with the continuously rising cost of making decisions? The average American will never hear about this cost because they are not exposed to the inner-workings of the healthcare industry. But ask anyone who actually works in healthcare, and they’ll be the first to admit that it simply takes way too long to make decisions, at every level in the organization. Everyone in the industry is a culprit – IT, doctors, researchers, nurses, administration, finance, and of course let’s not forget procurement. Talk about the left hand not knowing what the right hand is doing. If I had a nickel for every time a business or IT executive told me to avoid procurement at all costs, well I’d be broke because I would’ve invested it in the stock market, but that’s another story. I would estimate that the time it takes, on average, to get signature on contracts in healthcare adds anywhere from 10% to 40% of an additional cost to the actual project. This is not chump change; this is hundreds of thousands of dollars! So, why does this inefficient, ineffective process persist? Well for some it’s simply job security, but for the industry as a whole, I’m not sure. 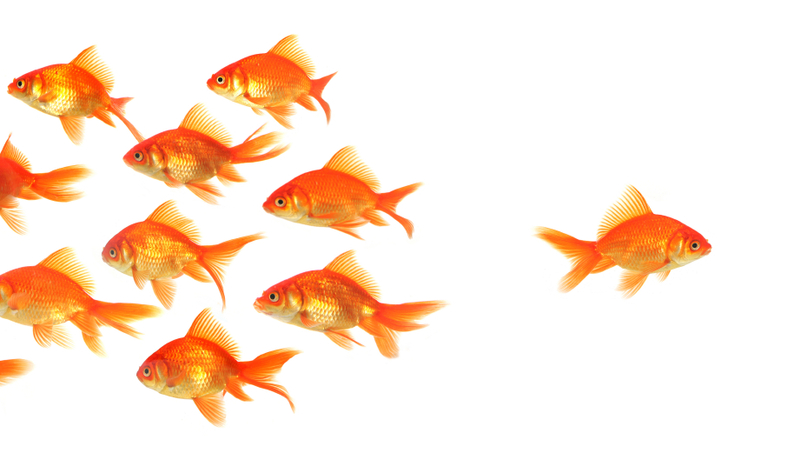 Why is it that healthcare provider’s pay executives, top managers, and other leaders tons of money only to limit their ability to lead? It is not difficult to identify the most qualified person in the room. Let him or her make the decision. Yes, supporting details are needed and blah blah blah…my point is this – it should not take 4 monthly steering committee meetings, 12 operational committee meetings, hundreds of back and forth emails and spreadsheets, and a few executive or board presentations sprinkled in to determine what should’ve been obvious within the first few days (maybe weeks depending on the complexity of the decision). If you can’t make a decision, find someone that will. 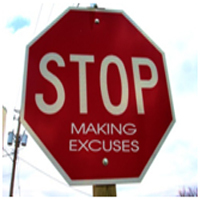 And then stop asking for more time, more “phone calls to discuss”, or a delayed start date. Why? – because it’s wasting your money and my time. First, a small note on terminology: We often hear the term “business intelligence” used as the overarching label for these now-familiar graphical dashboard UIs that enable direct, end-user access to actionable metrics, insightful analytics and the rich, multi-dimensional substantiating data that underlie the top-level presentation. Interactive drill-down; rules-based transformation of data, derivation of facts, and classification of events; hierarchical navigation; and role-based access to progressively disaggregated and increasingly identified data sets are some of the commonly implemented capabilities. However, we have found that most client organizations will re-cast the “BI” moniker to a more subject- or mission-related name for the system and its intended objectives. “Clinical Intelligence”, “Quality Analytics” and “Financial Performance Management” are examples. These names are chosen to apply more directly to the mission, focus and objectives of the specific subject area(s) for which the system is being designed and deployed. But they often have similar expectations with regard to the data and the end-user capabilities that will be present, and the following principles equally. Often, the first questions the organization asks focus on the technical components; the platforms, tools and applications that will form the eventual solution. Which ETL tools should we use? Which cube design tools are best for our needs? How do we integrate with standard vocabulary services? What do we use to design and deploy our dashboards? 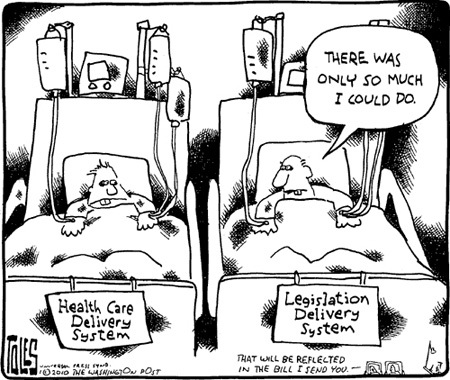 These “how to” choices will follow consideration of the “what” needs for the system. 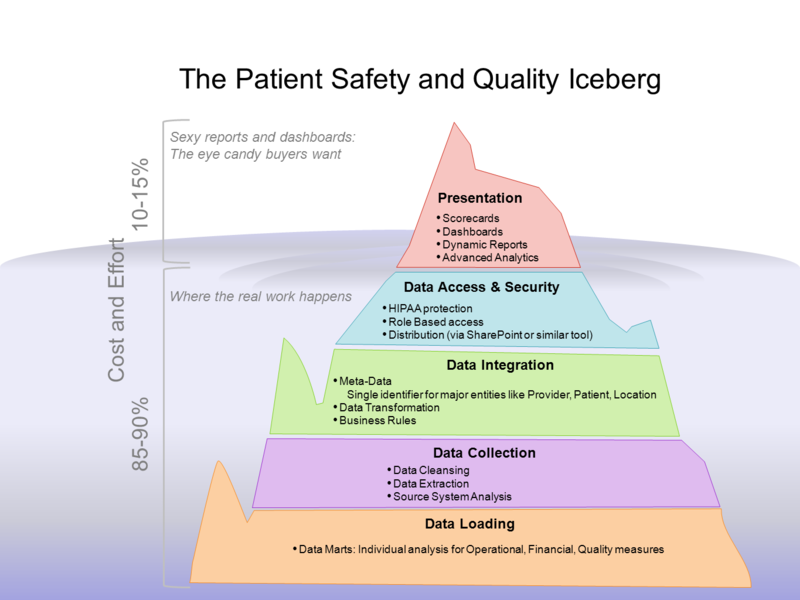 The primary components for data receipt and uptake, most frequently receiving raw transaction data from upstream (source) operational and transactional (OLTP) systems, such as an electronic medical record (EMR) system, surgery scheduling system, billing and reimbursement system, or claims processing system. The portfolio of source systems can be diverse and extensive, and can include the messaging traffic that travels between and synchronizes these individual systems. Primary data that is captured and exchanged can range from standard, discrete data elements, to less structured collections (e.g. documents), to diverse binary formats originating from virtually any point of care device type. The primary purpose of these components is to capture the raw data (and/or meta-data) elements that reflect the domain-specific (e.g. clinical, financial) operational or event context in which the primary data originated, propagating this data downstream for consumption in an analytic context. Data obtained from a mission-focused transactional system will almost invariably need to be computed, mapped, translated, combined, aggregated, aligned or otherwise transformed to enable its consumption for more analytic (OLAP) applications. Mapping the raw source data elements onto a standard taxonomy and aligning them with a designated ontology or other conceptual model of the subject domain can enhance the stability and extend the useful life of your data. Various forms of derived data elements will arise, including various asymmetric relationships between elements existing in a data lineage. This serves to enrich the raw source data, both increasing its relevance and improving its consume-ability for the anticipated (and often unanticipated) analytic contexts. Pipelining raw data elements through various “enrichment engines” can increase their value and usefulness to a broader set of audiences. Mapping atomic-level clinical procedure encodings to higher levels in a hierarchy; assigning cases to service lines and resolving overlap conflicts to support differing analytic objectives; and linking isolated events to a network of terms in a standard vocabulary are all examples that can improve the consume-ability of individual or collections of data elements. The volumes of data gathered and organized into an enterprise-scale data warehouse (EDW) or other integrated repository will require a spectrum of storage approaches to meet the competing demands of user consumption patterns and dynamics. The demands of some data consumers will require operational data stores (ODS) that combine data from multiple sources, and deliver it to the point of consumption in a timely manner, using various high-throughput staging strategies to align key elements and minimize the latency between the occurrence of the primary event and the availability of the combined data in the ODS. EDWs integrate (and often rationalize) information from multiple sources (and potentially multiple ODSs) often according to a comprehensive universal data model that reflects the primary data entities and their relationships, facilitating and enhancing the future consumption of the data in a wide variety of unanticipated use cases. Data cubes can emphasize and optimize the dimensional characteristics of the data entities, and facilitate the hierarchical segmentation, navigation and exploration of the captured subject domain. Unstructured data elements or collections, including binary data types (e.g. images, voltage tracings, videos, audios, etc.) present different storage requirements, often including explicit separation of indexing and other meta-data from the primary data. The delivery of data is complete when the end-consumer has gained access to the desired data sets; using the required retrieval, analytics and presentation tools or applications; under the proper controls. The user experience might include dashboards or other interactive graphical data displays and navigational UIs; rule-driven alerts to notify critical parties of specific conditions or escalating events; analytic and predictive models for exploring hypotheses or projecting “what if” scenarios; and communication tools for distributing, and corresponding with other stakeholders or trading partners on the underlying issues reflected in the information being consumed and even tracking their resolution. These are the recurring, primary, top-level building blocks. My next blog will delve into the program components you can apply to drive the definition, design and implementation of your analytics system. Successful implementation of BI analytics requires more than a careful selection of technology platforms, tools and applications. The selection of technical components will ideally follow the definition of the organization’s needs for these capabilities. The program components outlined next time will offer a start on the journey to proactive embedded analytics, driving the desired improvement throughout your enterprise. 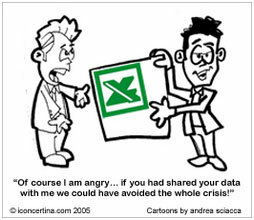 One of the big struggles in healthcare is the difficulty of Master Data Management. 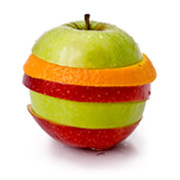 A typical regional hospital organization can have upwards of 200+ healthcare applications, multiple versions of systems and, of course, many, many “hidden” departmental applications. In that situation, Master Data Management for the enterprise as a whole can seem like a daunting task. Experience dictates that those who are successful in this effort start with one important weapon: data and application governance. Data and application governance can often be compared to building police stations, but it is much more than that. Governance in healthcare must begin with an understanding of data as an asset to the enterprise. For example, developing an Enterprise Master Patient Index (EMPI) is creating a key asset for healthcare providers to verify the identity of a patient independent of how they enter the healthcare delivery system. Patients are more than a surgical case, an outpatient visit or pharmacy visit. Master data management in healthcare is the cornerstone of moving to treating patients across the entire continuum of care, independent of applications and location of care. Bringing the ambulatory, acute care and home care settings into one view will provide assurance to patients that a healthcare organization is managing the entire enterprise. Tracking healthcare providers and their credentials across multiple hospitals, clinics and offices is another master data management challenge. While there are specialized applications for managing doctor’s credentials, there are not enterprise-level views that encompass all types of healthcare professionals in a large healthcare organization and their respective certifications. In addition, this provider provisioning should be closely aligned with security and access to protected healthcare information. A well designed governance program can supervise the creation of this key master data and the integration across the organization. An enterprise view of Master Data provides a core foundation for exploiting an organizations data to its full potential and offers dividends beyond the required investment. Healthcare organizations are facing many upcoming challenges with reference data as a part of master data management, especially as the mandated change from ICD-9 to ICD-10 codes approaches. Hierarchies are the magic behind business analytics – the ability to define roll-up and drill-downs of information. Core business concepts should be implemented as master data – how does the organization view itself? 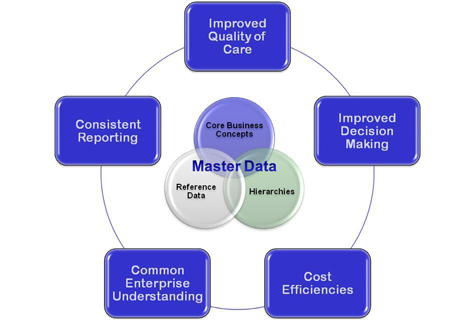 The benefits of a carefully defined and well governed master data management program are many: Consistent reporting of trusted information, a common enterprise understanding of information, cost efficiencies of reliable data, improved decision making from trusted authoritative sources, and most importantly in healthcare, improved quality of care. 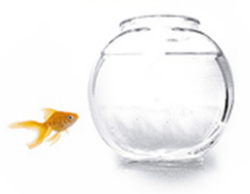 Data and application governance is the key to success with master data management. Just like an inventory, key data elements, tables and reference data must be cataloged and carefully managed. Master data must be guarded by three types of key people: a data owner, a data steward and a data guardian. The data owner must take responsibility for the creation and maintenance of the key asset. The data steward will be the subject matter expert that determines the quality of the master data and its appropriate application and security. Finally, the data guardian is the information technology professional that oversees the database, the proper back-up and recovery of the data assets and manages the delivery of the information. In all three roles, accountability is important and overseen by an enterprise information management (EIM) group that is composed of key data owners and executive IT management. In summary, master data management provides the thread that ties all other data in the enterprise together. It is worth the challenge to create, maintain and govern properly. For success, pick the right people, understand the process and use a reliable technology.